During a recent prolonged cold snap, I noticed a small spot of blood at the end of my dog’s face. Whether from rooting around and sniffing at normally pliable ground that had frozen over, or simply from chapping due to repeated exposure, Baby had a small cut on the top of her nose. Like any concerned dog owner, my first impulse was to retreat to my medicine cabinet for a tube of Neosporin. As I removed the top of the antibacterial ointment, I wondered, can you put Neosporin on dogs? What is Neosporin? How does it work? Is Neosporin safe for use on dogs’ eyes, ears or paws? Can you put Neosporin on dogs’ stitches or sutures? What happens if a dog licked or ingested Neosporin? Are there Neosporin alternatives for dogs? First, what is Neosporin? How does it work? Is Neosporin safe to use on an injured dog? Photography ©fotoedu | Thinkstock. In its standard, regular-strength formula, Neosporin is the brand-name for a common over-the-counter triple antibiotic ointment. Why “triple” as a descriptor? Because it contains three antibiotic agents: Bacitracin, Neomycin and Polymyxin B. All three of these antibiotics are touted for their ability to prevent infection caused specifically by bacteria. Since it was first sold in the 1950s, the brand itself has become a byword where small injuries are concerned. As a topical cream, Neosporin is meant to prevent minor cuts, scrapes and wounds on the skin from being exacerbated by bacterial infection. It is also supposed to speed healing in broken skin. Studies have shown that, as an antibacterial agent, there is actually very little difference in infection prevention or healing speed if an abrasion is cleaned immediately than when it is treated with Neosporin. It also has no effect on infections caused by other foreign agents, such as a fungus or a virus. Like most over-the-counter medications, humans probably use Neosporin as a force of habit, and without any real necessity. Should this knowledge impact how we approach putting Neosporin on dogs on dogs? For dogs, this is the primary use: minor scrapes and abrasions, and only after you’ve cleaned it beforehand with either warm water or a very simple saline solution. Unless you have your veterinarian’s approval, avoid extra-strength varieties or ones with added active ingredients for pain relief. If your dog has anything more intense or involved, like a major gash, open wound, a bite from a strange dog or any other forest creature, clean the wound and seek veterinary attention. Where small wound care in dogs is concerned, Neosporin is one of the human medications that is most-frequently recommended by veterinarians as safe for use on dogs. What about other scenarios? If you notice redness, itching, or broken skin in more troubling, hard to reach or delicate spots on your dog’s body, is Neosporin still safe to use? Is Neosporin safe for dogs’ eyes, ears or paws? For instance, what if you spot some green mucus gathering in the corner of your dog’s eye, the telling sign of an eye infection? Reach for plain saline solution and a cotton ball first, not the Neosporin. Many dog eye infections are caused by irritants that get trapped in the corner of the eye or under an eyelid. In dogs, medicated cream can be both an irritant and an allergen; using it can make your dog’s eyes worse. Do not use your topical antibiotic in or on your dog’s eyes unless you have your vet’s approval! 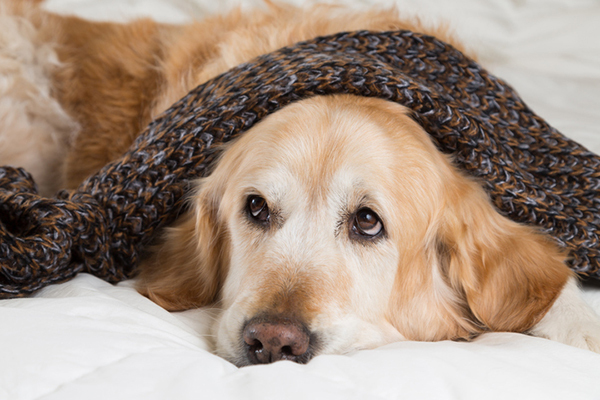 Ear infections in dogs are typically caused by environmental allergens — such as plant sensitivity or parasite bites — too much hair in a dog’s ear canal, or trapped water. You’ll have to treat the underlying cause before trying to tackle any secondary bruising or infection that develops as a result. How do you clean a dog’s ears? Dogster has excellent advice on how to clean your dogs’ ears, which doesn’t involve any complex human medication. Made up of collagen, keratin and adipose, the paw pads on the bottom of a dog’s feet are not like the skin on the rest of their body. Like a dog’s ears, if there’s a wound or injury, you’ll need to figure out if it has an external cause, such as a splinter, before slathering on the salve. Since dog tongues will often be in contact with any problematic areas they can reach, even a thin coat of Neosporin will involve a multi-step process, including regular washing and bandaging. Can you put Neosporin on a dog’s stitches or sutures? As detailed above, the cream is for minor wounds, and is not meant for treating surgical sites. Neosporin is intended to prevent bacterial growth. If your dog has recently been spayed or neutered, or had a different kind of invasive surgery, antibacterial provisions are part of any such operation. The first and primary lines of defense are the stitches and sutures themselves. Should you notice any post-operative issues, consult your veterinarian, not your medicine cabinet. Help! My dog ingested Neosporin! Used as its meant to be, it is very unlikely that you’ll live through a disaster film plot when your dog starts licking the pea-sized drop you used. If applied in a place where a dog’s tongue can easily lick it, it’s also unlikely to do your dog any good. In its regular-strength formula, even if a dog should somehow manage to squeeze out and ingest an entire tube, the worst you’re likely to experience is temporary vomiting or diarrhea. If you’re very concerned, and have $50 on you, you should call the Pet Poison Helpline. Are there alternatives to Neosporin for dogs? Is Neosporin safe for dogs? For minor cuts, scrapes, and abrasions, and if it gives you peace of mind, yes. Vets and human doctors are just as likely to say it should be in every human or pet first aid kit, as to say neither you nor your dog should use it at all! The official Neosporin website explicitly states, “we can’t recommend using these products on animals.” Some human doctors don’t even recommend that we use it on ourselves as often as we do! In almost every canine instance where you’re tempted to grab your favorite triple antibiotic, you and your dog are just as well served by cleaning the wound and covering it with petroleum jelly! The post Can You Put Neosporin on Dogs? What to Know About Neosporin on Dogs appeared first on Dogster.